Use these 30 tips along with our CV checklist (you’ll find details of that at the bottom of the page) to create the perfect reskilling CV! Start from scratch – seriously, don’t try to update a CV you already have. This is a huge mistake! As a candidate who’s only worked in other industries, this will not sell your skills to pharmaceutical industry employers. Start with a blank sheet of paper. Address the fact that you’re reskilling – make sure that industry courses are prominently placed and perhaps even look to address the issues directly in your profile section by outlining your motivation for change and why you think you’re suited to the industry. Keep it concise – two pages is optimal unless you’re told otherwise. Stick to a basic format – personal details, academic background, work experience, professional/industry qualifications, other interests. Reverse chronological order – within each of these headings, lead the employer through your history starting with your most recent experience and working back. The idea is to show that you’ve gradually been gaining the skills and experience that is needed to be able to do this job. Be specific – outline specific duties, responsibilities or experiences you’ve had (use our skills assessment tools to help). You can’t assume that an employer in a new industry knows what your old job involved, you’ve really got to spell out the similarities. Also be sure to use their language when tailoring your CV – if they ask for a certain skill in a job advert then make sure you use their phrase when discussing the skill. You may think a different phrase means exactly the same thing… they might not. Keep it relevant – in terms of jobs, there should be a continuous list, but if there really are a limited number of transferable skills (are you sure you’ve considered everything?) then keep it brief and leave yourself the room to expand in other areas. Jargon & Abbreviations – you’ve got to remember you are changing industries, don’t use too much jargon from your old career or the message might get lost. Don’t just list your jobs – list responsibilities, measurable successes, targets you met and key achievements. If possible, keep a note for interviews as to how these are transferable to the specific new job you’re applying for. Keep it legible – there’s a temptation when you feel restricted by space to just make the font smaller and reduce the spacing of your document. Don’t do it! You want your CV to be easy to read – don’t put the employer off before they’ve even read about you! To get some inspiration, check out our CV templates. Be clear – take time to consider the key points and make sure they stand out once on paper, use formatting (such as bold and underlining) to make key points obvious on the page. Use a professional sounding email address – this one sounds simple but it’s amazing how many people use rather unprofessional sounding email addresses for their job hunt. If you’re in any doubt about how your email address will be perceived by employers, make a new one. It might seem like needless extra work but it’s worth it if even one employer takes you more seriously as a result. Your email address should be as close to [yourname]@[emailprovider].com as possible. And while we’re on this subject, remember that if you attach a profile picture to your email accounts (looking at you, Gmail users), employers are able to see that too. Make sure that’s also portraying the professional image you’re looking for. Personal profile section – keep this section short, relevant and packed full of keywords from the advert. This is the place you catch someone’s attention, give them a reason to read on. Academic history – list out institution, course title, and grade. If relevant, give details of modules (this is particularly important if you have an industry relevant module that wouldn’t be obvious from the overall course name). Employment history – keep it relevant. Every single bullet point under every role should contribute to an employer’s idea that you are a good fit for their role. Professional/Industry qualifications – don’t forget to mention all these ‘extras’ you might have completed as part of previous roles. Other skills – what else is relevant for the employer to know? Do you have additional skills that you’ve not found a place for so far on your CV, include them here. For example, you might consider computer skills, specialist driving licenses or languages. As with everything else, only include them if they’re relevant to the role you’re applying to. Interests/Volunteering – this is a great place to show some extra skills that you’ve not been able to show in other areas. Don’t waste this section by just listing a couple of hobbies, spell out what skills you’ve strengthened as a result. Always include any achievements and successes in this section too. References – either write “References Available Upon Request” or give specific details. If you’re giving details, be sure to explain how this person is connected to you (former supervisor, manager, etc). Leave no gaps – wherever possible, someone reading your CV should be able to track your through education and employment with no gaps. If you’ve had breaks in employment, can you show volunteering during these times? If there are still times where there’s a gap on your CV, just be aware that you might be asked about it at interview – have a concise answer ready to confidently deliver. Include details – don’t just make broad, sweeping statements. Make precise statements and claims, backed up with facts. Include details and figures wherever possible to make your points even more impactful. Don’t include… – what you don’t include in almost as important as what you do. Your CV shouldn’t include your marital status, your nationality or your date of birth. It also shouldn’t explicitly state your gender. Be sure of your facts – every single thing on your CV should be something you can discuss at great length at interview if required. You need to be able to back up claims with facts, figures, and examples. Don’t ever feel tempted to lie on a CV. Include a link to your LinkedIn profile – make it easy for an employer to find out more about you. Your space is limited on a CV – hopefully you’ve managed to highlight the important points but why not include a link to your LinkedIn profile so an employer can learn a bit more about you if they want to? Bonus tip – make sure your privacy settings allow you to see who’s looked at your page so you can see and follow up with any prospective employers. Not yet using LinkedIn? You should be! Check out this article for more information. Edit… and then edit again – if you have an extensive work history then don’t feel the need to include a detailed discussion of absolutely everything. Minimise roles that aren’t adding value to your application and use the space for relevant information instead. If you have several roles at the start of a long career that aren’t in any way relevant (remembering to identify transferable skills), then you can leave them off entirely and pick up your work history later on, with more relevant roles. Save it correctly – the safest format to save it is pdf (the filename will end “.pdf”) as this will maintain any formatting and it will look exactly the same to someone opening it on any system. It also stops people from accidentally making changes to your CV when they’ve got the file open (since the format is read-only). If, for whatever reason, you don’t want to use a pdf, use a word file (file name will typically end “.doc” or “.docx”) as this is readable by most computers. Be aware though, that formatting can change dramatically between different computers when using this file type – even when it looks perfect to you when you save, a different computer may open it up and the formatting is off. Print it out – when you think you’re done, print a copy. There is a good chance this is how the employer will view it, so it’s important that everything looks good on paper. Put it down, do something else and come back to re-read it with a clear head and fresh eyes. Still happy? Then you’re probably ready to give it to someone else to read! Get feedback – You simply must get other people to give you honest, candid and pointed feedback on your CV. Have at least three other people read your completed CV and give you honest feedback. These should ideally be people in the pharmaceutical or med device industries, who can give you specific and constructive comments. Having spent as long as you have on your CV, it is easy to find a lot of recommended changes demoralizing but it’s better to hear it all at this point in the process, so accept their feedback graciously! ADAPT IT FOR EVERY APPLICATION – having given you 28 other tips, this one might be the most important. Pick key skills and qualities the employer is looking for out of the job advert and make sure they are clearly displayed on your CV. Reorder bullet points to bring the most relevant points to the top of the list and make full use of bold and underlining to highlight key points. Be sure to download our CV checklist! That document will give you a step-by-step guide to creating a great CV. 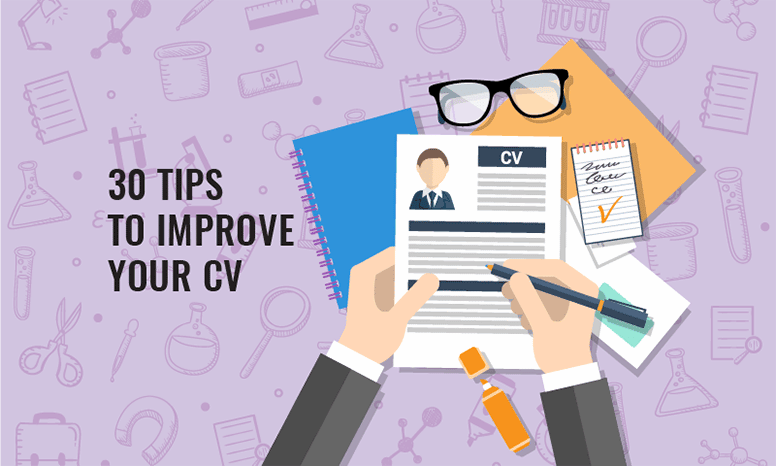 You shouldn’t be sending out your CV to an employer until it ticks all the boxes on that checklist! Get your copy by clicking the link below. And at the end of all that, you’ll have a knockout CV that not only mentions your career history and reskilling journey but sells them as major benefits to an employer. Good luck!